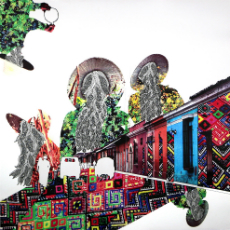 Harold Washington Library Center hosts a Hispanic Heritage Month art exhibit featuring the work of artist Hale Ekinci. Pieces from Ekinci's exhibit Symbolic Habitats will be on display on the 3rd floor from September 15 through October 15. My work explores the absurd yet serious, traditional but whimsical, complex and simple narratives of the human condition; particularly regarding tribes of people connected by culture, tradition and language. In Symbolic Habitats, I turn my lens to Mayan culture in Guatemala. During a trip to Guatemala for a collaborative documentary film project, I photographed and researched how natives sustain, worship and apply indigenous traditions to modern life. Through the combination of illustration and digital collage transfers of these photos, I craft colorful and symbolic pattern-based images on paper. Cultural traditions and personal stories, words, sayings, translations—visible or not—are the backbone of my work. Personal experiences, embellished with made-up Kafkaesque details along with old shamanistic rituals make the basis of the non-linear stories I tell. My vision for each composition originates from the Mayans’ point of view that every living element is connected and sacred. By juxtaposing various identities and habitats from around the world, I incorporate human relationships to the earth: the rituals of gathering, fishing, harvesting plants, evil eyes and urban settlements. My mixed-media drawings and video animations use various beings and symbols to create compositions that explore these relationships through visual metaphors embodied in human/nature/architecture hybrid forms. Therefore inviting the viewer to explore this interconnectivity in new ways. I translate each culture’s narrative of the human condition into visual mix that together re-imagine and guide a connected global human experience. See the list of artists exhibiting at CPL during Hispanic Heritage Month.